This is especially true of the Georgetown Art Attack! Featuring contemporary visual and performing art and activities throughout Seattle’s oldest neighborhood. Walking? Be sure to hop on the FREE Art Ride to experience our west end studios and galleries such as Equinox Studios, studio e and SANCA. Running every 15 minutes in a full circle so you don’t miss a thing! Fantagraphics Bookstore & Gallery presents Visual Abuse: Jim Blanchard‘s Graphic Art 1982 – 2002. Book signing and exhibition focusing of Blanchard’s posters, illustrations and record covers from Seattle’s grungemovement. All City Coffee is exhibiting John Ohannesian: Recent Works. Paintings and ink drawings of the artist’s cartoon world. Original pieces published in The Intruder, The Seattle Weekly and online at The Seattle Star. Rainier Glass Studio become part of the glass art experience beginning at 7pm with live demonstrations during Art Attack. Browse the gallery of NW artists unique blown glass art and get inspired to reserve a spot blow your own seasonal piece. Bridge Productions is pleased to present Emily Gherard‘s MAKING PRESENCE KNOWN, hauntingly tender works, evoking a feeling of landscapes receding into the distance, or figures emerging from the fog. Employing the accumulation of repetitive marks or tearing, scratching, or sanding the surface to remove a day’s labor, Gherard builds up a physicality which brings tangible weight and gravity to her work. The Hammie Salon exhibit Water & Light — A celebration of light, color and texture, new work by Deb McCarroll including limited-edition printed salmon and textured works bursting with color and light opens on Saturday November 12 for Art Attack. McCarroll’s love for natural processes is on display in her layered paintings of Northwest-themed birds, fish and moody umbrellas. “I love materials that show age and history. Natural imperfections, oxidation-I love ‘painting’ with that kind of chemistry. 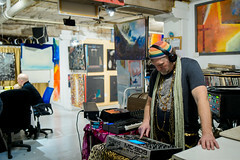 Krab Jab Studios will be open for Art Attack, 6-9pm featuring resident and guest artists. Beautifully told tales in mixed mediums. Eight and Sand Please join Eight and Sand for their 3 year anniversary celebration with the annual holiday giftable art group show. Many works priced $100 and under and a first ever back inventory sale thru until December fifth. Georgetown Trailer Park Mall Join the The Georgetown Trailer Park Mall on November 12 at 7pm for a night of punk! Hostile Makeover, an all-female cover band, will be playing the likes of Iggy Pop, L7, Concrete Blonde and many more. PLUS, we’re throwing a birthday party for one of our beloved shop owners! This event is free and open to all who rock. See Facebook to RSVP. Status Ceramics invites you to visit their gallery for unique handmade gifts and tours of their ceramics studio! 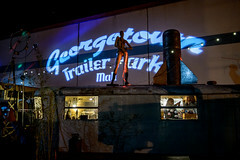 Located directly behind the Trailer Park Mall, Status Ceramics will be open from 6-9 during the Georgetown Art Attack. studio e Warren Dykeman’s show “Would I go home again?” carries forward a familiar language the artist has called upon throughout his career. Multiple means of communication dominate his image making, in the form of signage and universal directions. His disgorged jumble of letters and forms make a direct reference to communication. This interest in communication becomes apparent in his robotic and silhouette renderings. 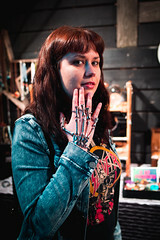 Equinox Studios is an arts community in West Georgetown, home to over 100 artists working in an inspiring array of mediums, including dance, blacksmithing, welding, woodworking, cycle fabrication, sculpture, painting, film, glass and art performances monthly. 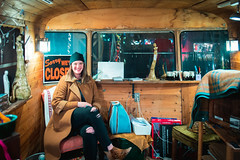 Machine House Brewery is hosting Cry Now, Smile Later, a show of photographs from Seattle photographers Christopher Brown, Tara Sloan, and Ryan Mortensen. The Georgetown Liquor Company presents The Art of Dave Ryan (Manticore Stencil Art) for the months of November & December! Pop art on records, celebrity stencil portraits, nerdy naturescapes, and more!